Enjoy full relaxation after a long day on the Flash Furniture Contemporary Calcutta Chocolate Microfiber Chaise Rocker Recliner. 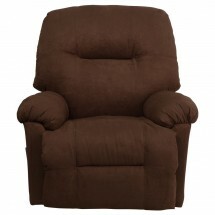 Featuring Dacron wrapped 1.8 resiliency foam with microfiber upholstery, this recliner provides excellent support for the ultimate seating experience. 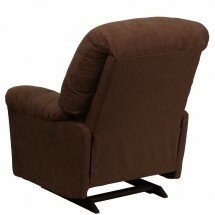 Thanks to its lever mechanism, you can lean back and put up your feet with minimal effort while its rocker feature provides smooth gliding motions. 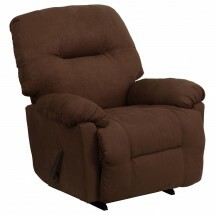 For easy clean-up and maintenance, this rocker recliner can be spot cleaned with a damp cloth. Dimension: 36" x 40" - 64" x 41"